Holistic Essentials Course Registration - Holistic Actions! Broader understanding of what health and disease is and how to approach it, monitor it and “intervene”. How to proactively prevent dis-ease by changing your view. How to build and preserve vitality by becoming your pet’s advocate. How to know when your pet is getting sick even before your veterinarian. The details of fresh food feeding (including recipes). How to preserve vitality by avoiding vaccines and other toxins. How to build vitality by maximizing exercise and mental stimulation. 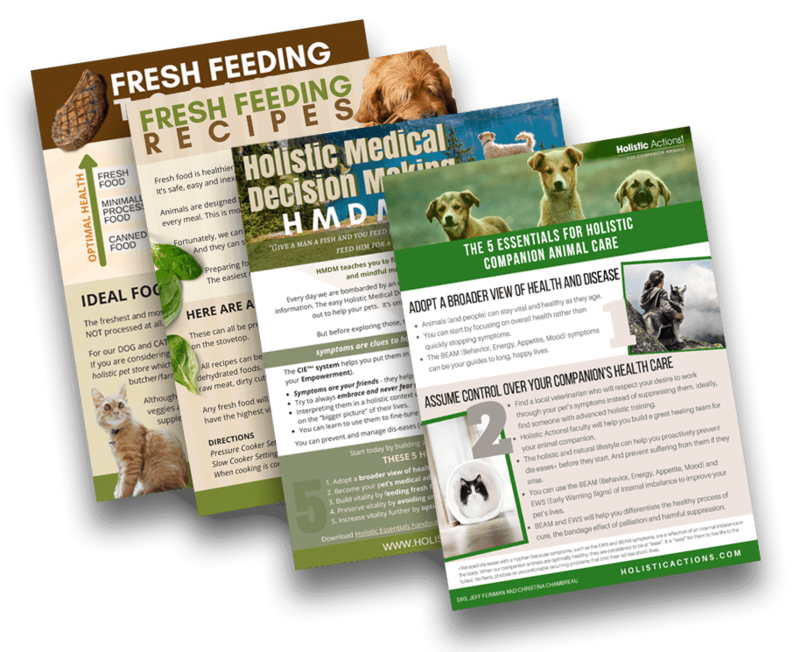 Using HMDM – Holistic Medical Decision Making in your pet’s (and your own) lives. How to create a healing team with veterinarians and lay practitioners whose goal is whole health. NOTE: This is an online TEXT course (NOT VIDEO). The lessons are accessed via your personal “my courses” section on holisticactions.com. You retain indefinite access to all the course material, so you can take however long you need to complete the course. In addition to 10 detailed lessons, you will receive 5 downloadable handouts that you can print out, including fresh feeding recipes, feeding guidelines with links for food, hmdm protocol. You will feel more confident and empowered in taking charge of your pet’s health. You will have enough resources to start feeding your animals fresh wholesome diet. You will feel inspired to live clean supportive lifestyle and eliminate unnecessary toxins. You will be able to start building a holistic support team for your pet care. You will start tracking your animals symptoms and be able to make medical decisions with more ease and confidence.